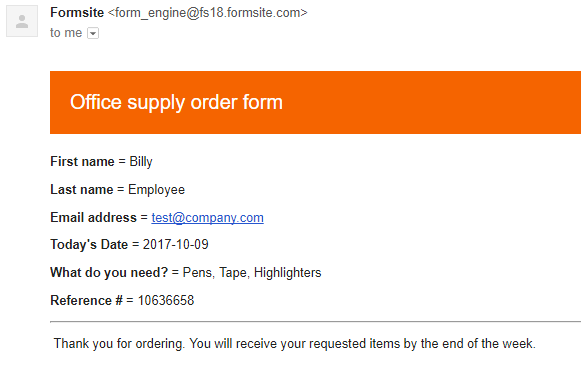 Posted on October 9, 2017 by Billy S.
One of Formsite’s most popular features is the ability to send an email after every successful form submission. Our Notifications allow form builders to send multiple emails in a variety of formats and completely customize the message and results sent. A common use for the notification message is to create a custom email receipt with the visitor’s answers. Passing the form answers to the email allows form owners to make personalized messages with the visitor’s responses and is possible using the form items’ pipe codes. The built-in formats that the system sends the form results include the Text and Table formats, along with PDF (for Pro 2+ accounts) and Secure Link. Both Text and Table formats contain the questions and answers for all input items. The Table format adds additional table formatting to the result information that makes the message easier to read. 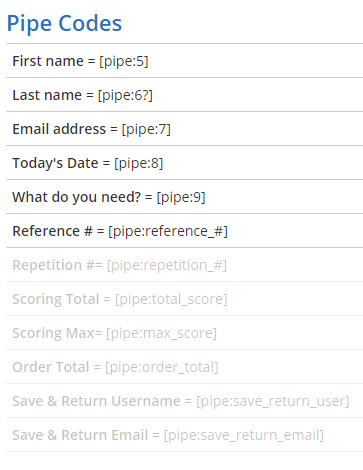 The Text and Table formats only include the form’s input items, so making receipts that include formatting items (images, additional text, etc.) will require customizing the Notification message area and piping. We received your order for [pipe:5] products. We received your order for 3 products. See the documentation page for more information about piping. 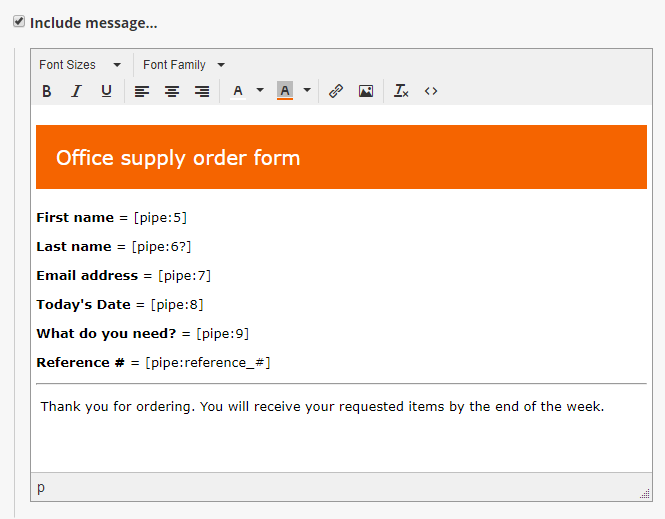 Creating an email receipt is done by using the pipe codes in the Notification message area. 1. 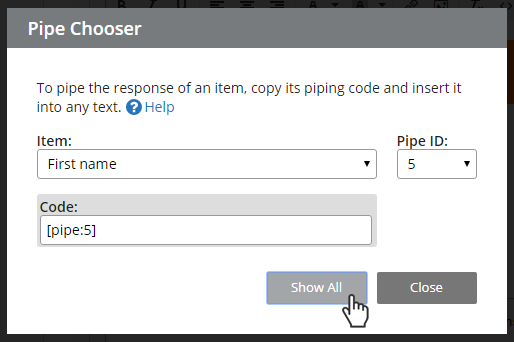 The easiest way to make the custom receipt is by clicking ‘Insert Pipe’, then click the Show All button. 2. Next, select the text and copy, then go back to your notification message and paste. 3. Modify the pasted text to show only the items needed then customize the email formatting. Test the message by viewing and submitting the form.